Before I got off work the other day I was doing some paperwork and someone came to the desk and asked a question. I looked up and much to my surprise, it was Elvis. He looked exactly like Elvis, he spoke like Elvis - he was Elvis, dressed in a black button down shirt and black slacks. He said he was back from the dead, I told him he looked better now than before he died. The funny thing is, this guy was really Elvis Presley. I kid you not, his license said he was. He was shorter than I imagined. The article really isn't about his house but there is a picture of it here. The house itself isn't so impressive but it sure is unusual to have planes parked out front like that. They make the house look smaller than it is. Parkhurst was home alone Friday afternoon eating a snack of sliced apples when one became lodged in her windpipe. After smacking herself against a chair to dislodge it, she started beating herself on the chest, which she thinks alerted Toby to the problem. "The next think I know, Toby’s up on his hind feet and he’s got his front paws on my shoulders," she told the Cecil Whig. "He pushed me to the ground, and once I was on my back, he began jumping up and down on my chest." I don't know, it seems a little embellished. It reminds me of a story I read after the tornado outbreak near Orlando earlier this year, I wish I could find a link to it. It seems the person involved was in bed or laying on a sofa and he (she?) heard a loud noise and the ceiling started caving in. Seeing this the dog rushed to her aid and pulled her to safety onto the floor before the ceiling crashed down where she was laying. I may not have all the details right, I remember reading it in disbelief, too much happened in literally the blink of an eye. It could have happened, just not exactly as fast as the story let on. The good news is she was thrown off the case for doing it. I predict this Ninja will have a movie deal one of these days. Microsoft Vista has really not had a great reception and I keep hearing people say to buy a Mac or get Linux instead. I have to say, though, I really don't think that's good advice for most people. I don't think most people should rush out to get Vista either, though. I haven't tried Vista and I don't think I will be trying it soon, preferring to wait until they get the problem areas fixed. I just don't have the resources to play around with it - wish I did. I understand the desire to get away from Microsoft, but I think it's a little premature to offer that advice to the average consumer. I like Linux, I really do. It's an awesome operating system and I want to see it gain popularity. And it has. But it's not for everyone, not yet. Progress has been made and it's so much better than when I was first introduced to it, but it has more maturing to do. Think of Linux like a street legal race car, home-built of course by skilled craftsmen. Sleek, fast, cool. No power windows or A/C here. They're working on it. The Mac is like the BMW, Mercedes or Porsche of the computer world. Not only is it sleek, fast and cool, it's comfortable, too. It's got Tiptronic, you can shift yourself or put it in automatic and enjoy the ride. But, it's too expensive to buy and repair. I have a Mac Powerbook. I used it exclusively for a year or so. One of the hinges broke and I got quotes upward of a thousand dollars to fix. It was a couple hundred just to buy the hinge. I ended up buying one on eBay and replacing it myself. Still cost a lot and it never should have broke in the first place - it's a known problem with the Powerbook. There is a stronger replacement hinge available now but it's still over $200.00. Then one of the memory modules went bad, soon after that the CD drive died, and finally the hard drive went south. I replaced the parts myself but it's not something just anyone can do. The average consumer would have had a much larger repair bill. I upgraded to OS-X Tiger when I fixed it and my wife uses it mostly now. I liked it but I don't miss it. I am not a fan of proprietary products. Oh, and the other hinge is broken now. I bought a Gateway laptop with Windows XP to replace it and I'm much happier with it. It's lasted longer, too. I'm not interested in buying another Mac. I would probably use OS-X if it was usable on a PC. I never could get completely comfortable with it though. I feel like right-handed man in a left-handed world. I also built my own desktop computer, try that with a Mac. I like all the choices available with a PC based computer. If you are technically challenged and just want your computer to work out of the box, go with Windows or OS-X. If your pocketbook is challenged, too - stick with Windows XP. If you have a lot of spare time and enjoy tinkering with your computer then Linux may be for you - it's not ready for my Mother yet. When it's ready for her, then you got something. That would be your Windows killer. It is part of a war on truth, a war on God and a deliberate war on history. And, more to the point, it is an illustration of how there are many Americans alive today who are active America haters. To be perfectly blunt with you, if Americans forget how God has blessed them throughout history, we seal our doom. As has been widely reported, Gore's Tennessee mansion consumes 20 times the energy of the average home in that state. But it's OK, according to the priests of global warming. Gore has purchased "carbon offsets." It took the Catholic Church hundreds of years to develop corrupt practices such as papal indulgences. The global warming religion has barely been around for 20 years, and yet its devotees are allowed to pollute by the simple expedient of paying for papal indulgences called "carbon offsets." I think it's so funny to watch people who deny God exists and hate religion, ignorantly following what amounts to just another religion, a different god - definitely - but a god nonetheless. It's also interesting that these religious "images" (environmentalism, globalism, socialism, communism - now global warming) are getting larger and more powerful, deceiving more and more people. It's getting easier to see the hordes gathered around their idol bowing in worship, doing the will of their god. Their idols are ideas, the work of men's minds. they have hands, but they do not handle; they have feet, but they do not walk; they do not mutter through their throat. Cool new discoveries and pictures of the sun. "Almost every day, we look at the data and we say – what the heck was that?" says Golub, a member of the XRT science team. France opens secret UFO files covering 50 years and we find ... Nothing! "We do not have the least proof that extra-terrestrials are behind the unexplained phenomena." But then he added: "Nor do we have the least proof that they aren't." When I was in high school I used to eat Dannon Banana yogurt, it was my favorite flavor, back when they came in paper/cardboard cups. I moved around a lot after that, including going overseas and I haven't seen it since. The closest they had was Strawberry/banana. Some other companies make a banana flavor but it just isn't the same, not even close. I went to Publix today and imagine my surprise to see Publix brand Banana yogurt - fruit on the bottom style. Of course I bought some, and it tastes like I remember it. Now I just hope they keep it available. The man, identified by law enforcement officials as Fadhel al-Maliki, 35, was detained at passenger screening at the airport just before 6 a.m. on Tuesday morning. The bomb squad was called as a precaution and authorities said they found wires in his clothing and a magnet inside a lower body cavity. 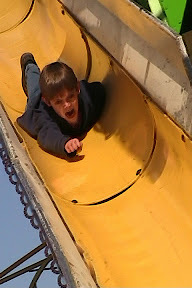 I took James to the county fair a couple of weeks back and took this of him coming down a slide. He had a lot of fun. John Adams said, "Remember, democracy never lasts long. It soon wastes, exhausts and murders itself. There was never a democracy yet that did not commit suicide." Chief Justice John Marshall observed, "Between a balanced republic and a democracy, the difference is like that between order and chaos." Our founders intended for us to have a limited republican form of government where rights precede government and there is rule of law. Citizens, as well as government officials, are accountable to the same laws. Government intervenes in civil society only to protect its citizens against force and fraud, but does not intervene in the cases of peaceable, voluntary exchange. By contrast, in a democracy, the majority rules either directly or through its elected representatives. The law is whatever the government deems it to be. Rights may be granted or taken away. As March of Dimes researchers put it, "Changes in diagnosis account for the observed increase in autism." Sure enough, California data show the rise in autism diagnoses almost exactly matches a decline in cases of retardation. "People that we once called quirky or geeky or nerdy are now called autistic," Dr. Offit said, "because when you give that label of, say, autistic spectrum disorder, you allow that child then to qualify for services." Imagine that. A trendy diagnosis being driven by government-paid services.